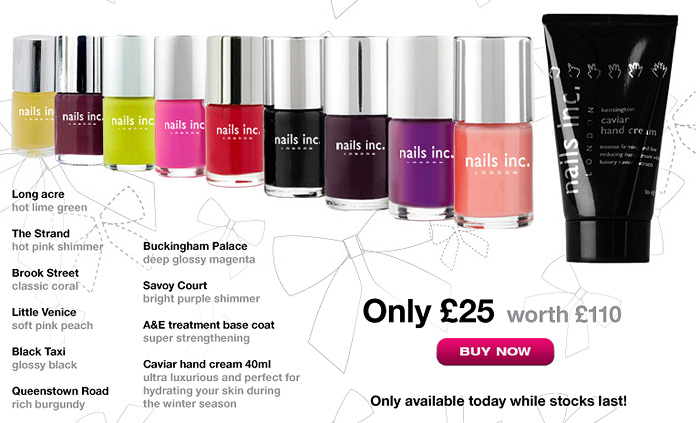 Nails Inc Ten Products for £25 – Today Only! Click the image to be taken to the offer! There’s some really nice colours included no? I’m loving Savoy Court! I took advantage of the last offer and am hoping to get my hands on some HQHair goodies today, so will be grudgingly resisting the latest Nails Inc. temptation! Gaahh I’ve spent over £60 on nail polish in the last month. I don’t think I can justify any more *cries* Why must you endeavour to crush my resolve, oh wicked temptress? You, Charlotte, truly are a heathen. She is indeed a heathen but I’ve done well with using stuff and my project 10 pan this month/week and I don’t think £2.50 per bottle is expensive so I’m going to order them! @Leanne… I didn’t get it either.. too many lovely things to buy and not enough money. It’s always the way! @Rhamnousia – OOOOOh did you get them? Wanna win £75 worth of O.P.I courtesy of HQ Hair?